B'Cuzz Soil nutrients are designed to work specifically in growing media that already contain nutrient value, and were specifically developed for calcium-rich substrates. The B'cuzz 1-Component Soil Nutrition is a professional bio-mineral nutrition without ballast substances, which can easily be absorbed by the plant. It helps to initiate the flowering cycle of your crop and also ensures a healthy soil life. 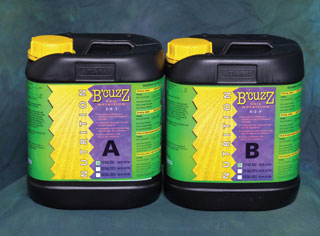 To ensure best results, use B'Cuzz bio-stimulants in conjunction with B'Cuzz Hydro Nutrients. Initial stage: 2.5 ml per liter of nutrient solution. After three weeks: 5 ml per liter of nutrient solution. For more information, please visit the manufacturer Atami's website.